The winter holidays are knocking at your door and every publisher writes to Santa asking for skyrocketing conversions and unprecedented revenues. It is quite an option for those who want to rely on old man’s favor. In fact, you can become your own Santa and be on a roll this Christmas. Wonder how it can be done? 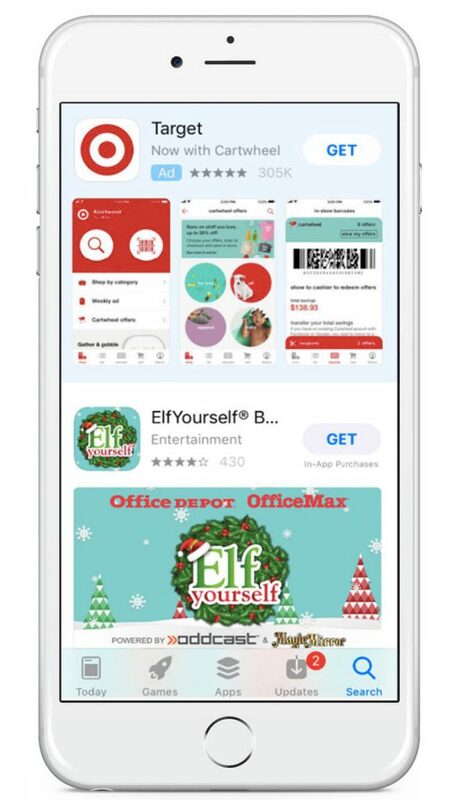 The answer is simple – thorough preparation of your app and its store product page – from icons and promo texts to app store screenshots – for the holiday season. 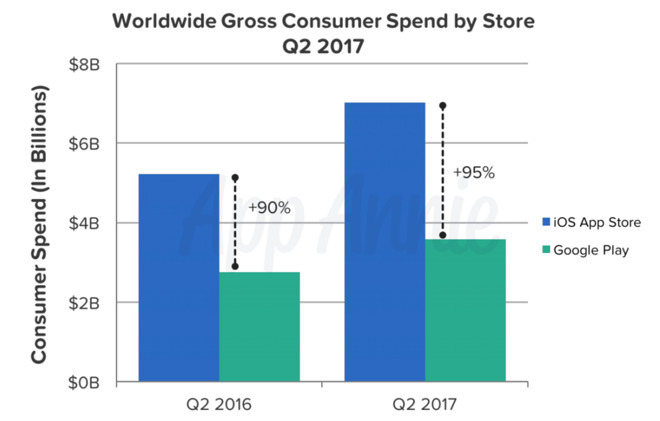 Apple reports that the App Store visitors made $240 million in customer purchases on New Year’s day 2017. It became the busiest day in the history of the App Store. It is also expected that this record will be topped this year. It’s a convincing reason to put aside all your tasks and engage in the festive optimization of your app. We, in our turn, will provide you with surefire tactics of boosting mobile growth this Christmas. 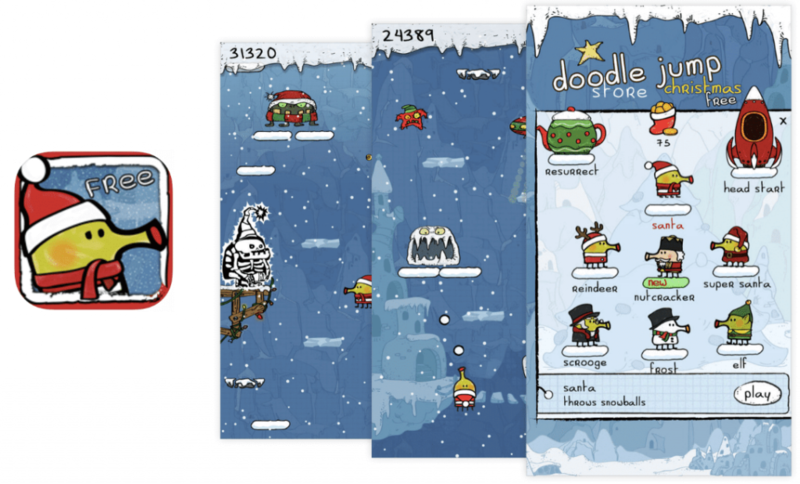 There are dozens of ways to promote and grow apps and games during the holiday season. From ASO, social media and PR activities to releasing a special holiday edition of your app. By the way, it’s the best time to release your holiday updates since they can appear in the best updates section. A/B test to increase conversion. Mobile marketers are used to app advertising on Facebook and Google. But not all of them seize the opportunity of buying target users and promoting their holiday updates with Apple Search Ads. 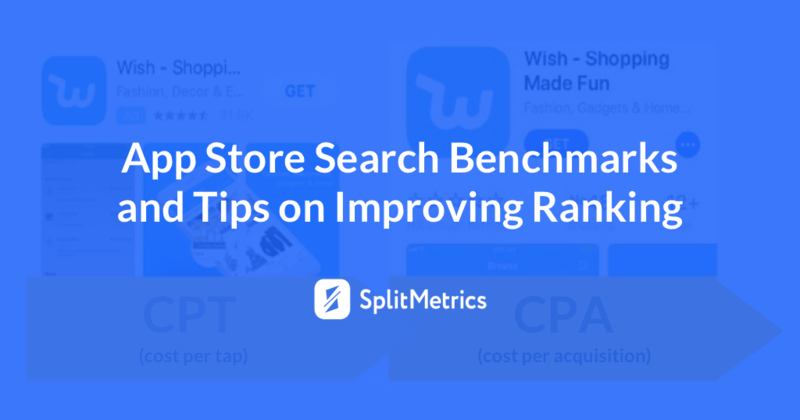 Being too short-sighted, they forget that store visitors use holiday-related search terms to find apps that have already released holiday updates and deals. 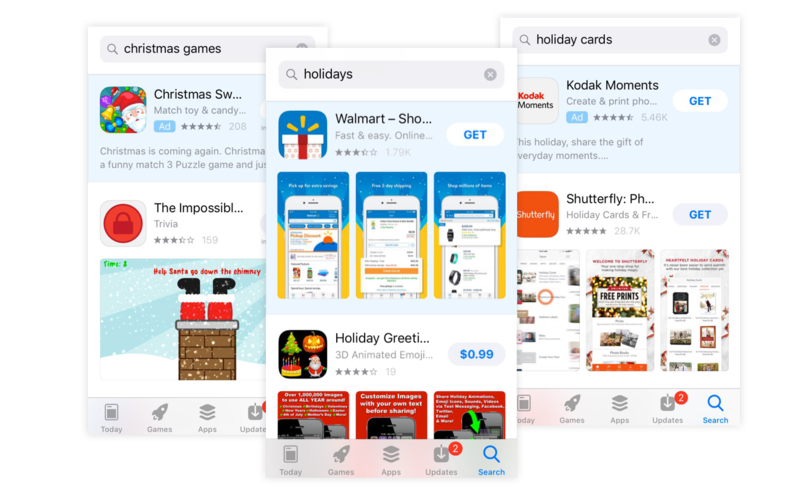 The truth is, there are plenty of keywords you can use to drive users with Apple Search Ads this festive season: from ‘Christmas games’ to ‘holiday apps’, ‘updates’, etc. 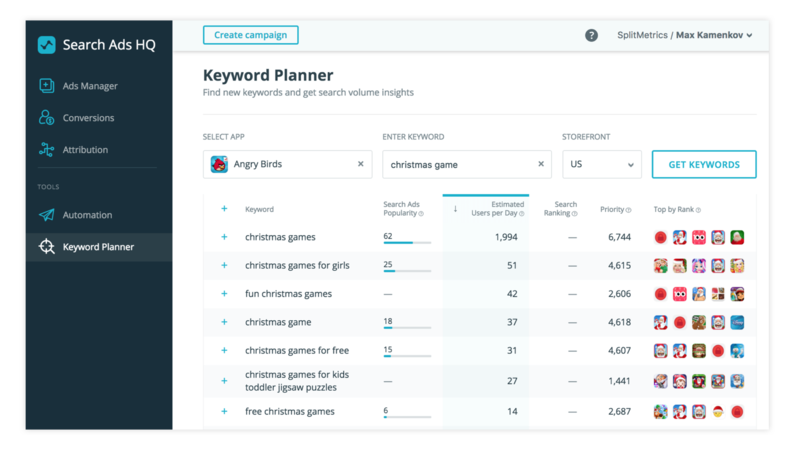 For example, according to stats from SearchAdsHQ Keyword Planner for Apple Search Ads, you can reach around 2,000 people daily by running the ad for the keyword “Christmas games”. Such giant as Walmart, Target, Kodak have already taken advantage of this traffic channel. 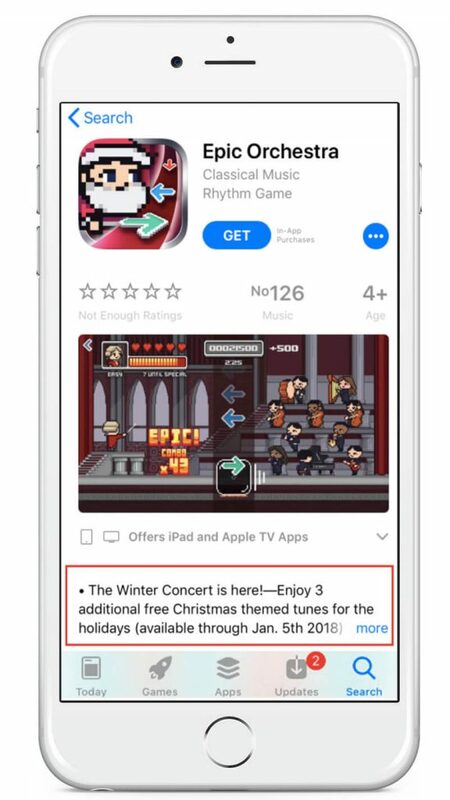 It’s a really efficient way of promoting Christmas games and apps that feature holiday updates. Above all, your app should feature relevant updates that would catch people who come from a holiday app page and lead them to the purchase. Your application or game should be relevant which presupposes having corresponding creatives: icon, screenshots, name, subtitle, description and promo text. That would ensure you get the highest possible TTR and conversion into installs. Plus, you’ll get rid of the ad spend waste. Your ads won’t start running if your app metadata has a low technical relevance (in the Apple’s terminology, a low relevance score). App Store calculates the score by scanning keywords in your app metadata: name, subtitle, promo text, description, etc. So, if you want to start running ads during the holiday season, you should sow holiday-related keywords on your product page. In-app purchases is a brand new feature introduced in iOS 11. It allows app publishers to promote in-apps and subscriptions. These elements are indexed and shown in the Search. It means that even if your application doesn’t appear in top-10 when a user enters “Christmas” or your app is not related to Christmas at all, you can promote your Holiday packs separately, reaching a wider audience, getting more target installs and in-app purchases eventually. Thus, adding holiday in-app purchases can help you promote your app product page. For instance, the app ‘Pic Collage – Photo Editor’ already does it. Furthermore, in-app purchases in an amazing way to announce special updates to existing users or users who have uninstalled your app. It is possible because in-app purchases appear above screenshots on the app product page. 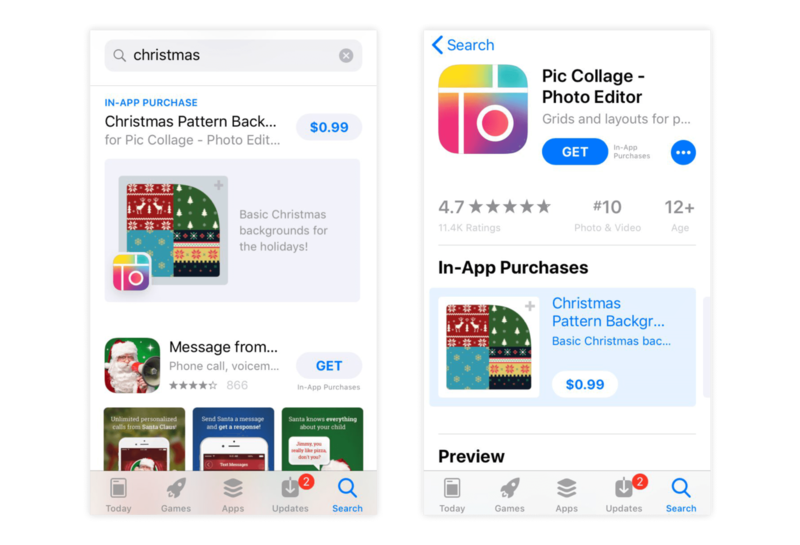 If you want to boost reach with in-app purchases, you will need to add them to the app store setting an icon, price, holiday-optimized name and holiday-optimized description. In the ‘Pic Collage’ example, they used ‘Christmas pattern background’ as the title and ‘Basic Christmas background for the holidays!’ as the subtitle. Quality UA videos is always a good idea. The very format encourages engagement as the mixture of audio, video and text gives users a better understanding of what your app can offer. The holiday season can become a great inspiration source for your UA video. 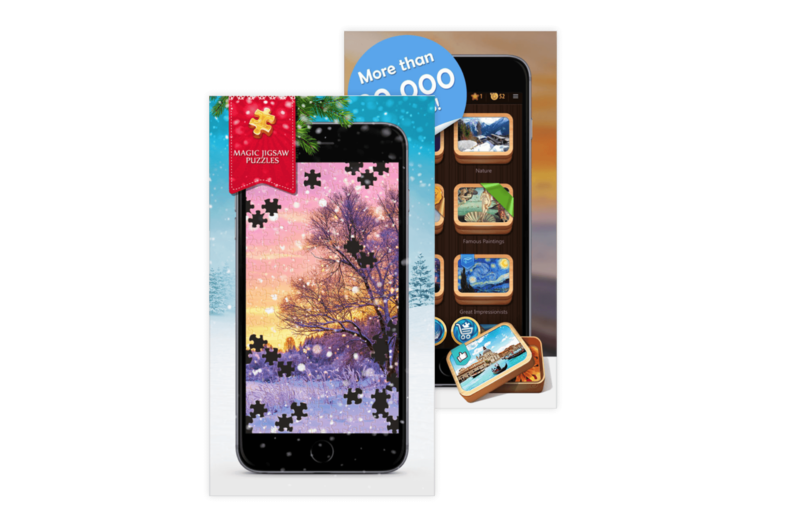 You can not only tell about the benefits of your app but also set truly magical and Christmasy mood. This year, Apptamin did a great job creating such video for Vivino. The golden rule to remember: app A/B testing is a must in the course of product page optimization for the holiday season. Even if your instincts never failed you, don’t let them drive you this time. To seize all opportunities Christmas offers, you need to make only data-driven decisions. This leads to another important aspect: don’t test more than one hypothesis at once. The truth is such experiments never bring trustworthy results. It’s usually just a waste of traffic and your time. Even if your 3-in-one A/B test gives positive results against all the odds, you won’t be able to detect what boosted conversion. Thus, you won’t be able to apply this winning strategy in the future. So, one A/B test – one element. This season, we’ve witnessed the amazing A/B testing results Social Point got. 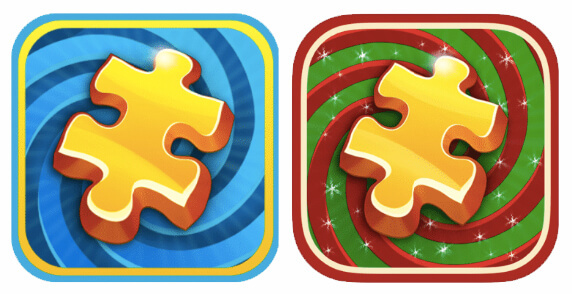 Optimizing the icon of their game Dragon City Mobile for the holidays, they managed to achieve an incredible conversion increase by 40%. 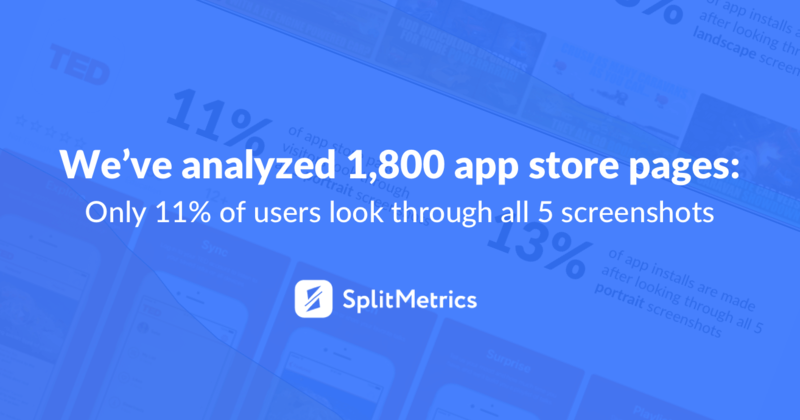 A/B test with SplitMetrics and find app page combinations that make users install your app. It’s really important to stay sensible decorating your icon, screenshots and all other creatives. Don’t overload them with tons of little details no matter how cute and Christmasy they are. It will do nothing but irritate and hinder users’ comprehension. It makes a lot of sense to start your holiday optimization with your app’s icon. According to the experience of our clients, incorporating festive attributes to your icon can give up to 47% conversion uplift. Impressive, right? Christmasifying your icon, stay true to its original concept. Your icon should still be recognizable. As I’ve mentioned before, Social Point did a great job optimizing the icon of their game Dragon City Mobile. All they did was changing the background to one with snowflakes without altering its original color. They also put a mask on the main character. These simple moves resulted in the impressive 40% uplift of installs. So, you see, there is no need to reinvent the wheel here. Just add holiday attributes keeping the concept unchanged. Getting down to optimization, keep in mind that it’s better not to replace core elements of your icon with holiday attributes. What is core element you may wonder. It is your character, loop, a conventional symbol of speed, etc. We’ve seen how publishers lost 47% of installs breaking this simple rule and we definitely don’t want you to follow their footsteps. The old, weird, yet effective trick called ‘Action mouth’ is attributable to Christmas optimization as well. If you look through the top games, you’ll discover something specifically common to most of them: the icons have characters with their mouths open. Such icons can give you up to 9% conversion uplift. The fact that this trick works still surprises many mobile marketers, but you can’t argue with numbers. So it’s definitely worth trying. Use colors that people associate with holidays. It’s another very straightforward but very efficient trick. Red, green, golden-yellow and white will help you lift the Christmas spirit. Using these festive colors can result in up to 15% boost in installs. However, mind cultural differences. It makes sense to spare time to research in which countries such palette won’t work that good due to cultural peculiarities. The same is true when it comes to holiday attributes. Remember that different countries have different festive attributes. It’s vital to remember that the app stays the same and targets the exact same audience as before. Once your icon is all festive and bright, it’s time to get on with screenshots optimization. In fact, screenshots are always worth your attention when it comes to optimization as they are informative and visual. Plus, they take a considerable part of your product page and draw a lot of attention. Optimizing your screenshots and featuring holiday updates can give you up to 25% installs increase. Let’s see how to make such conversion boost possible. Don’t rush to decorate all your screenshots with mistletoes, snowflakes and Santas. In fact, you’ll see the best results if you add holiday attributes and updates only to the first 2 screenshots. After all, users rarely scroll further than the first two screenshots. And even if they do, there is no need to turn your screenshots into a tasteless Christmas postcard, right? Similar to the festive optimization of icons, it’s not the best idea to alter the original concept beyond recognition. Sure, it makes sense to add a few Christmas attributes here and there, but the most important thing you should do is reflecting or highlighting major holiday updates you’ve prepared for your users. Intrigue them, ignite their desire to learn more and install your app. Of course, a two-screenshot rule doesn’t work if you do not add new holiday features but give your app a complete holiday look and vibe. In this case, all screenshots can be optimized as well. That said, it’s highly recommended to keep the whole concept/characters/colors unchanged. Since every little thing can influence conversions in a negative way. Another tip concerns screenshots orientation. Experiment with it. The App Store changed immensely with the emergence of iOS 11. Taking into consideration the renewed look of the search results page, it definitely makes sense to consider using landscape screenshots instead of portrait ones. This easy trick helps publishers to stand out in the search and can bring up to 45% more installs eventually. Another little gimmick here is to make your first screenshot look like a poster which usually turns the listing of your next competitor into a blind spot. The coolest thing about app product pages is that there are so many elements to optimize! Combining several elements in various ways, you can get stunning results. Normally, it takes only 20 minutes to optimize a promo text. However, a short and catchy promo text can show an average 35% conversion lift. With that said, we’ve seen a maximum increase of 75%. use it as a description summary in other cases. Apple gave us a super-powerful marketing tool, so use it! Great examples are Epic Orchestra and the Escapists. They promote their latest updates and even show end dates of their campaigns. It encourages App Store visitors to install the apps right here, right now. Another element that can persuade users that they need your application is a video app preview. We made a surprising discovery. To drive installs, holiday app previews shouldn’t be about sharing an exciting holiday spirit but about showing a holiday gameplay. We’ve seen examples of cinematic beautiful previews with a story, magic, music and professional voice-over. Despite the fact these videos engage people and a watch rate of cinematic app previews is almost 3 times higher than average previews, they’ve been losing to simple gameplay previews test after test. After watching 8-9 seconds of which people tend to install an app. Good news is that gameplay previews (that are usually much cheaper than cinematic ones) can work best for your application or game. I don’t want to be Grinch here but I have to remind that new applications and app updates won’t be accepted from 23 to 27 of December as always. So it’s really important to submit all your awesome creatives and festive keywords in advance. Providing you apply the tips and tricks mentioned in this guide to your ASO strategy, be sure your app will be in high fettle. Enough talking! It’s high time to take a glass of eggnog, turn on Frank Sinatra Christmas compilation, and get down to preparing your store product page for this holiday season.